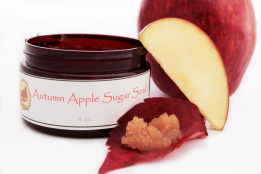 Make your shower extra sweet - polish your skin with a Sugar Scrub. Brown, white and raw sugar work to gently exfoliate those dead skin cells. Natural butters, nutrient packed oils and therapeutic essential oils provide protection while soothing your skin. Honey makes it even sweeter by locking in your skins own moisture. Ripe apple freshness with a little touch of sweet and spice. A warming, rich wake up blend with hints of coffee, cream, maple and chai spices. Ground pumpkin and honey exfoliate and enrich your skin. 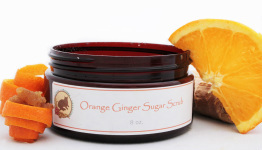 Wonderful in a sugar scrub. Amber, patchouli and rose whisk you away to an Autumn walk in the moonlight. Luscious oils moisturize your skin. Refreshing and light, and so right for your skin. Green tea extract and infused honey entice, a gentle waft of lemon verbena and cardamom brighten. Sugars exfoliate while coconut, aloe and hemp butters soothe and soften your skin. Catch the scent of fresh pine with the slightest touch of mint as the breeze passes from the ocean through the trees. Heavenly lavender with vanilla infused sugar whipped into shea and coco butters, blended with other oils and herbs for divinely decadent fragrance and skin satisfying softness. Crisp, clear fresh ginger and invigorating orange are the perfect way to start the day. Roses, roses, and roses in a subtle, softening romantic blend. 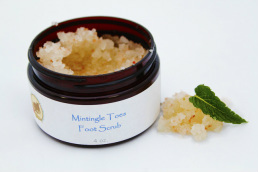 Dead Sea Salts and reinvigorating mint create a wonderful scrub and foot soak that softens and relaxes your tired tootsies. Here's a lemony fresh salt scrub with just a touch of gentle glycerin soap. Perfect for cleaning up after fishing, working on the car, heavy yard work or any time your hands get super gunky and smelly.